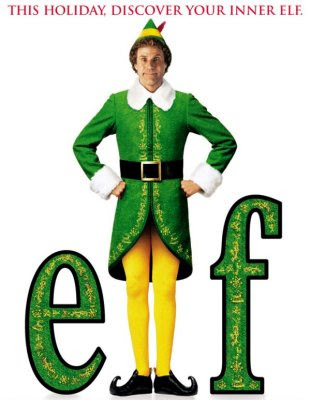 Buddy: Buddy the Elf! What's your favorite color? Buddy: What about santa's cookies? I suppose parents eat those too? Gimbel's Santa: Um, "Happy Birthday" of course. Ho, ho, ho, ho, ho, ho. How old are you son? Buddy: [after a pause] He's an angry elf. Buddy: [burps loud and long] Did you hear that? Buddy: Do you remember me? Deb: I do! I didn't recognize you! Buddy: I know I'm in work clothes! Nun: But the children love the books! Santa: I've been to New York thousands of times. Santa: Well, there are some things you should know. First off, you see gum on the street, leave it there. It isn't free candy. Santa: Second, there are, like, thirty Ray's Pizzas. They all claim to be the original. But the real one's on 11th. And if you see a sign that says "Peep Show", that doesn't mean that they're letting you look at the new toys before Christmas. Buddy: Actually, I'm a human, but I was raised by elves. Carolyn: I'm a human... raised by humans. Buddy: Have you seen these toilets? They're GINORMOUS! Buddy: Watch out, the yellow ones don't stop! Elf Teacher: Now, before we learn how to build the latest in extreme graphic chipset processors, let's recite the code of the elves, shall we? Buddy: It looks like a Christmas tree. Buddy: It's just nice to meet another human that shares my affinity for elf culture. Buddy: I thought maybe we could make ginger bread houses, and eat cookie dough, and go ice skating, and maybe even hold hands. Buddy: I passed through the seven levels of the Candy Cane forest, through the sea of swirly twirly gum drops, and then I walked through the Lincoln Tunnel. Buddy: [to the doctor] Can I listen to your necklace? Buddy: You did it! Congratulations! World's best cup of coffee! Great job, everybody! It's great to be here. Buddy: The best way to spread Christmas cheer is singing loud for all to hear. Buddy: I'm a cotton-headed ninny-muggins. Buddy: [reading the note he left on the etch-a-sketch] "I'm sorry I ruined your lives, and crammed eleven cookies into the VCR." Walter: What do you want? Some money? Buddy: No! I just wanted to meet you and thought maybe you might want to meet me. Walter: Who wouldn't wanna meet you? Buddy: [quickly, and high pitched] I love you. I love you! I LOVE YOU! Buddy: So... do you wanna eat food? Gimbel's Manager: [after Buddy has decorated the entire toy department] Hey guys, you seen the place? Pretty good, they must have brought in a professional. I dunno why, but someone's gunning for my job. But look, let's stick together on this. If you get wind of anything, call me on my radio. Channel three, code word is "Santa's got a brand new bag". That was better than watching the movie!